Yehudi Menuhin was born in New York in 1916. He moved to San Francisco at an early age, where he took violin lessons with Sigmund Anker and Louis Persinger. He made a string of early debuts as a prodigy: public debut in 1924 (Oakland); New York recital debut in 1926; European debut in 1927 (Paris); with Bruno Walter and the Berlin Philharmonic in 1929; Leipzig Gewandhaus centennial in 1931; first world tour in 1935. He continued his studies with Adolf Busch and Georges Enescu, who became his most important mentor. He founded schools at Stoke d'Abernon in Surrey, England and in Gstaad, Switzerland. He founded the Bath Festival in London in 1959 and was its director until 1968. He was a champion for professional and humanitarian causes (e.g., the political rehabilitation of Wilhelm Furtwängler after the Second World War and speaking out in Moscow for human rights in 1971). In 1965, Queen Elizabeth II presented him an honorary knighthood, and he was subsequently made a life peer. He assumed Swiss national allegiance in 1970 while retaining his American citizenship. He became president of Trinity College in 1970 after the death of Sir John Barbirolli, and he was the first musician to receive an honorary doctorate from the Sorbonne in Paris. He enjoyed a long career as a violinist (with periods of spotty technique at various times), a conductor and a teacher. He died in 1999. The following interview was a backgrounder for a feature article that ran in the Pasadena Star-News as an advance story for his appearance conducting the English String Orchestra at Ambassador Auditorium, Pasadena. 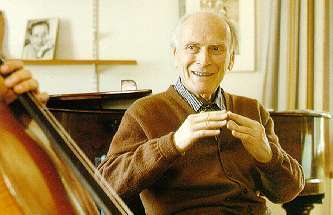 Lord Menuhin came across as an erudite man in touch with his inner Tibetan monk. When I made the mistake of asking him what accomplishment he was most proud of, he became thoroughly flustered -- as if he didn't know the meaning of the word. I spoke with Yehudi Menuhin on February 3, 1990. The fall of the Berlin Wall was a recent event, and the background context included the ongoing political upheavals in Eastern Europe and predictions of bloody factionalism in Yugoslavia. DB: Please forgive me if I ask questions that you've been answering for 60 years. YM: (Laughs) Well, I try to give a different answer each time. DB: Okay. Then let me ask you this, which is something you've probably been asked many times. Having been an extraordinarily gifted child, what is the most pervasive feeling you have about your childhood - that you were given extraordinary opportunities or that you were denied things that other children had? YM: Oh, on the contrary! I had the greatest of everything I was given - parents, home, care, attention, encouragement, inspiration, teachers, travel, friends. My God, I don't think any human being has ever had more given to him and more worth living for! And wife and children, music and companions and colleagues, orchestras and students. I don't think any life has ever been as full and satisfying or could be more so. DB: Given those things, is it difficult to top all of that in your everyday life? YM: No. It's just living that so marvelous. I’m not trying to top anything. I mean if you left me on an island with my wife alone somewhere in the Maldives, I'd be very, very happy. On the other hand, I was equally happy conducting the Vienna Philharmonic in Salzburg the night before last. So it's a wonderful life full of great contrasts, variety and interests, and I'm very much a part of the world we live in - in sharing all the despair, all the hope and all the tragedy and all the exaltation. Everything that's going on, I’m part of it in many ways. DB: Could you tell me a bit about what takes up your time and attention these days? I take it you mean the things that are happening to people in the world headlines. YM: Yes, I have all sorts of thoughts about them because I’ve identified with their music, with their composers, with their lives - whether it's Russia or it's Hungary or it’s England or America or even India or Japan or Spain or Italy. After all of these years - and I’ll be 75 next year and have traveled since I was 8 and lived in many parts of the world, played their music, know their musicians - I can really feel the pulse of all these peoples whether they’re in Africa or South America or, as I say, in India. Whether they are so-called “primitive” or they are highly evolved. I’ve spent my life with great interest listening to their voices. And therefore, it's much different than if you only read about them. Naturally, one learns a lot reading or going to the cinema - the television gives us their voices and their aspect. But playing their music and living with them - with their musicians - is something which I think enables one to share other lives in different parts of the world and even in different periods. I mean we share Bach’s period. We share the sacred music of the Gregorian chant. We share all these lives and their thoughts. And that's why a musician’s life is so fascinating. DB: For many people, there exist barriers both musically and culturally - or socially. Do you find then that you're able to break down those barriers? YM: Of course there are barriers, but life is made of paradoxes and conflicts. Those very barriers protect the styles, the rooted indigenous styles. People are attached to their traditions. Their own cooking and their own dialect and their own style of dancing and dressing and behavior. So a part of us is rooted and a part of us consists of branches and flowers that are open to the light of the world, and we have to balance these two things. I'm all for the federation of states and in the very same breath, I’m all for the cultural autonomy of regions. I feel both are equally important. DB: You’ve been a big champion of different musics - not just classical. How do you recognize quality and where do you draw the distinction between quality and non-quality? YM: It's the way you judge in article. Two articles may be perhaps saying the same thing in different ways, but one will be a cultivated voice understanding the public it addresses and sharing with it some sympathy and avoiding the fanatical. And the other will be crude and just say, "I want" or "I hate" or “I want to be loud" or “I want to be nasty. I have no value in the me, but I want to make trouble for others." There are all kinds of ways of being a nuisance - of being vulgar. And there are many, many ways of presenting an argument in a cultivated way. No one could ever accuse the great composers of being uncultivated. DB: Given all contrasts and variety in the world, do you find yourself making new discoveries even today? YM: Oh yes! Such as learning everyday. Learning and playing and teaching the violin. In understanding people and drawing parallels between art and life and science. In speaking to my own children. Every day brings a host of experience, of impressions, of thoughts, of responsibilities - the things I must do or prepare or work on a reply to or consider or formulate - so that life is a constant school. In fact, certainly I’m learning something every day. DB: What sorts of parallels do you see between art and science? YM: I find a mind like Bach’s or Bartók’s as disciplined, as precise, as structured as the most exacting scientific mind. And at the same time, creative. One mustn’t imagine that there is a great cleft. They are both forms of discovery and revelation. However, science proceeds from the assumption that we don't move until we prove something. There's a security about science and there is an elusive quality about art. There is no questioning that. But the two are equally important within their own domains. The great scientist has as much intuitive guidance like Einstein had or other great people in the world of astronomy and physics. Those were seers. You cannot deny that the great musical minds were almost computer minds, too. The fugues of Bach alone would require that which has hardly been equaled - not to speak of lesser composers with great minds like Reger. These were people who really knew their material in the same way that a great sculptor knows his stone or his bronze. DB: Speaking of great minds, you've probably met a great many celebrated people. Who that you’ve met stands out as a great mind in your estimation? YM: I think people who overcome knowledge. (Laughs). If you know what I mean, people who haven't lost the human touch and who are great in their compassion and who have extraordinary command of knowledge. But they're more humble and great at the same time than the knowledge they possess. I knew Enesco as great a human mind as ever I encountered - and Bartok. Two totally different people - the one from Romania, the other from Hungary. But they were both people who were terribly concerned with the young and the teaching of the young. And Kodaly with him - Bartok - gathering material from tribes that were disappearing and carrying away their life’s voices and secrets and melodies. There were concerned with the world, with nature. They adored nature. Bartók was as much a Red Indian in his way. He was supposed to spend the last two years of his life engaged by a northwestern university in Seattle with the Red Indians of the Northwest. And he would have given them a language. That's the greatness that appeals to me. It's not a cold greatness. It's a warm greatness, if you know I mean. DB: What accomplishments do you feel most proud of? YM: Oh, I'm not proud of - I mean - I feel that whatever I've tried to do, I haven't done alone even though I often took the initiative. I’m part of a world that has made everything possible for me. But “proud.” I can tell you what I enjoy doing. I love making music or conducting or teaching. I love my school. “Proud.” I suppose it's not only pride. If I can make someone happy or alleviate what's disturbing them or guide them to a better expression in music or suggest something that may be useful on any level. There are thoughts and conversations that I have with many people, and sometimes it hits the right note and at that moment, I'm very glad that it works both ways. I have also very definite ideas, whether they're right or wrong only fate will determine, about the direction in which the whole of Europe should move politically. I know many of the people who are in the forefront, but I know better yet the pulse and the mood of the people through the musicians and through the public. I think that to know the leaders is not sufficient because often they’re totally out of touch with the people. It's just as important to know the people who are doing the work. For instance, talking of teaching, it's very important to know the teachers. You may know the ministers of education, but they themselves often don't have the understanding of the people who are doing the work in the schools. They deal in abstractions. I think much of human troubles and tragedies and miseries come from the fact that we often take - being very, very clever and evolving theories of one kind or another - we take refuge behind abstractions and fight each other over things that have no value, no truth or reality in terms of everyday existence. DB: Here in this country, we have a tradition of Democratic thinking and tolerance. DB: When we look at Europe, we tend to imagine that they have similar traditions when in fact, some parts don't. There's great strong nationalism today. Can they overcome that? YM: Well certainly there's no background in Russia for the democratic institutions that are known and so well established in Western Europe. However, the people are very clever and very intelligent and they're very well-educated, many of them. There was no background for astronauts two generations ago, and yet we’re producing them. We're producing all kinds of people and all kinds of sciences and disciplines that didn't exist awhile ago. I think that literature and a grounding in history, which the Russians do have, is important because after all, one does not necessarily have to go the whole way. Once the way has been opened by others, the next people to go over the road cover it much more quickly. Our democracy is no secret in Russia. They have already shown that they can debate and they can make decisions in parliaments. I don't think that that need be an insurmountable burden. And of course the lands of Poland and Hungary, they're extremely evolved, very close to the West - Hungary once part of the Austro-Hungarian empire and the Poles with their Catholic sophistication. I don't think that they will lack any talent or any ability to create free societies. What they need is example, encouragement, the right kind of support - not necessarily always financial but inspirational and every opportunity to live up to high expectations. One of the troubles is that the realists of the world always assume that people will live down to the worst possible expectation. That they will fall upon each other, tear each other to pieces, attack everything and so on. But it’s simply because those who lead the world often do not give the right example. After all, we sell arms just like Russia and Czechoslovakia and France and Italy and Israel. We succumb to all kinds of plagues of every description. But I find it very interesting that this country - my country, I was born here and remain an American -this country, which is the great showpiece, the proud and best example in many ways of the capitalist system, is fighting capitalism with tooth and mail in Columbia, South America. That, if anything, is the free market place. It's the drug scene. That's free market, and yet we are compelled to fight it in every way. So that nothing that's left entirely free to go its own way can be good. It must eventually be brought under control. That goes for democracy. That goes for capitalism. It certainly goes for communism. It goes for every kind of theory, even for love. Pushed to its extreme, if it's unframed or unbounded it can go astray. DB: We spoke earlier of barriers - political, cultural, nationalistic. Do you see those as a problem? YM: Yes! I think of nationalism as one of the worst outcroppings of the 19th-century and something, which by rights, doesn't belong in the 20th and certainly not in the 21st century. I think that we need regional cultures of great autonomy and character and at the same time, federal structures which would protect the independence of these regions. The federated process. Eastern Europe, possibly one block, gradually getting closer and closer to Western Europe - and eventually the whole of Europe keeping peace in the world together with America, Canada, the British Commonwealth and Russia. That is the direction in which we should be moving. How long it will take, whether it will take 500 years or 50 years or five years, that's anybody's guess. But the direction is that. DB: Well put. I used the word “proud” once before and maybe that was the wrong word. YM: I think it's "satisfaction." DB: Let me ask you this, then. What is the most "courageous" thing that you've ever done? YM: You know, I don't think I've ever been aware of doing anything courageous. I don't know. Oh, I did stick my neck out once. But that's not courage. That's just simply saying what I feel. DB: Like your speech in Moscow or your stand on Furtwängler? YM: No, it wasn't really courage. It was simply the fact that I felt I owed a certain loyalty to a colleague who had been put in the dock for really no good reason except for guilt of association, and I didn't think that was sufficient. I was given the message by his colleagues in France. Now, no one could have been more anti-Germany than the French at the end of the war. And yet when I asked them which musician - which of the German musicians they would be prepared to accept, they said Furtwängler. So I thought I had a duty to my colleagues to pass the message on. That's all I did, I assure you. It wasn't any such thing as trying to either be courageous or appear courageous. Nothing of the sort. DB: Well, you came under a great deal of fire after that. YM: Oh yes, yes! But even then you know, it was a lot of fuss about nothing because when I went to Israel, the whole thing collapsed like a pack of cards. I totally understood their feelings. I didn't share them, but I understood how they felt - that they had a right to those feelings given the situation in the Holocaust, but the world won’t survive on that alone. I’m very well liked in Israel actually, and what I feel is even more important than being liked or loved, I'm trusted. That is the most important thing.